Was on my way to another sales call yesterday when I saw this car pulled up alongside at the traffic lights. 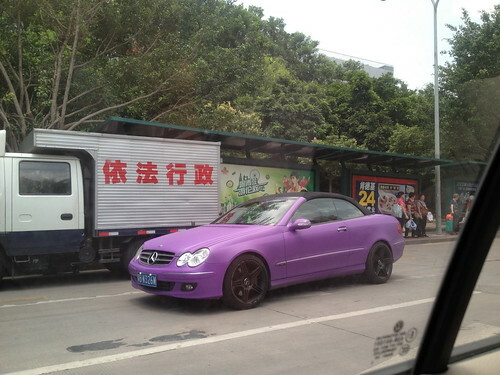 Barney's in da house and driving a what I believed to be a Mercedes Benz CLK. This has certainly replaced the No.1 ranking of most awful gaudy car I have ever seen. The last disaster I saw was a Lambourghini Coutach in a Datsun-Pickup-Truck Blue at Havelock Road many years back. I am sure you can still spot these trucks in Pulau Ubin, Desaru and/or other more laid-back towns in the region. p.s. I wonder if anyone has a better photo of the pick-up truck blue that I am talking about. The one I managed to find on the web is a tad small. Would prefer a larger image to illustrate the point better.